I forgot my password/username, help! How do I get support for Cloud CMA? How do I make requests for new features? How do I create a CMA? How do I create a Buyer Tour? How do I create a CMA using e-mail? How do I create a Buyer Tour using e-mail? How do I create a Property Report using e-mail? Q. I forgot my password/username, help! Q. How do I cancel my subscription to Cloud CMA? A. Make sure you are logged in to your account. Click on your email address on the upper right of the screen (it should be in green text). Then click on the Account section of the black navigation bar. Read the text "Need to cancel your account" for further instructions. Q. How do I get support for Cloud CMA? Q. How do I report a bug? Q. How do I make requests for new features? Q. How do I create a CMA? A. You can create a CMA in three simple steps. Once I select the CMA tab and click on the "Create a new CMA Report" button I am presented with 3 boxes. Two on top, one on the bottom. These boxes have a series of fields that must be filled out. Fill out every field if possible. If you don't have a picture of the subject property don't worry. Cloud CMA will automatically insert an aerial photo of the home via Google Maps. If you haven't gone to the MLS and searched for comps you might want to have Cloud CMA pull listings that are close to the subject property. Cloud CMA does this by drawing an imaginary box around the subject property and pulling any listings (actives, pending, expireds, and solids) until it reaches the limit you set. When you have chosen you method of pulling comps click on the "Fetch Listings" button. If you entered MLS numbers in the previous screen chances are you won't need to do much fiddling here. But if you had Cloud CMA pull the listings for you it a good idea to make sure you have some valid comps. You will see your comps in what we call "listing cards". They will have a letter on the left hand side. The cards will have some detail regarding the listings. If you want more detail just click on the "Details & Adjustment" link in green. If you don't want any of these listings to be included in your CMA simply click on the black check mark on the far right of the listing card. On the right hand side of the screen you notice a box that is labeled "Summary of Listings" and "Summary of Prices". This shows you the total number of listings selected along with the low, high average and median of those listings. This is a easy way for you to reference how your comps compare to your suggested list price. Once you are happy with your comps press the button labeled "Customize Report". The CMA report does not include much other supplemental data besides the MLS. It does give you the option to include a valuation by Cyberhomes. On the right hand side of the screen you'll notice a box labeled "Listing Content" it also includes the headers, "Listing Layout" and "Report Theme". Here's where you can choose to add or remove any of the supplemental data include with the report. Keep in mind these are global settings, meaning you cannot pick and choose if you want some comps to have additional data and some that do not. If you deselect "Additional listing photos", all additional listings photo for all your comps will not be displayed. Here you can choose how you want the comps to be displayed. Basically there are two formats. Either with a map or a second property photo. This is helpful if you have a lot of listings but don't want to print out a single page for each listing. We have 10 themes (we are always adding more). These are different designs for your reports. It's a good idea to familiarize your self with the different look and feel each report displays. So once you have selected what Listing Content you want and Layout of the listings, and what type of Report Theme you want the next step is click "Publish"
When you click on Publish you will be brought back to the CMA tab. Notice the spinning arrows? That tells you Cloud CMA is generating your report. Once they arrows have stopped spinning you will see a green check mark appear over the report icon. This tells you the report is now ready to View, Print or E-mail. Q. How do I create a Buyer Tour? A. 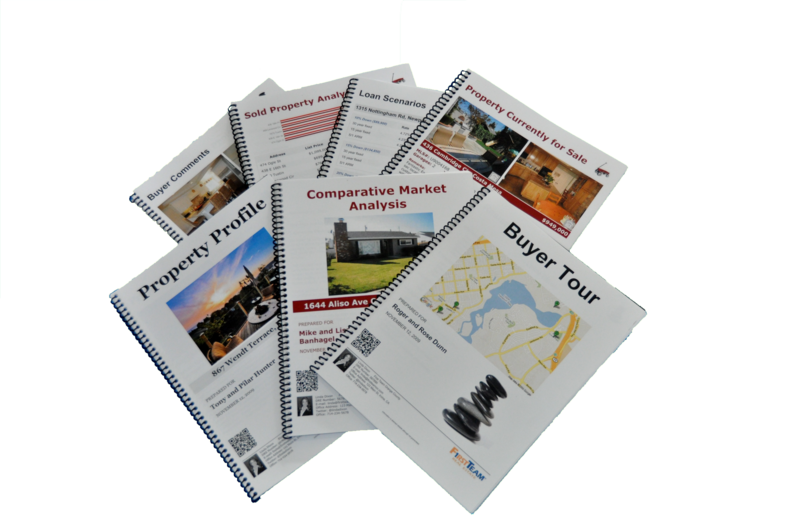 Once you have the MLS numbers of the active properties you want to include on your Buyer Tour report you can create a Buyer Tour in three simple steps. Once I select the Buyer Tour tab and click on the "Create a new Buyer Tour" button I am presented with one box, labeled "Create the report" with 3 fields to fill out. Fill out every field if possible. You must enter MLS numbers for each property on tour, street addressees will not work. Now click the button labeled, "Fetch Listings"
You will see the properties include on the tour in what we call "listing cards". They will have a letter on the left hand side. Most likely all your listings will be labeled with "A" for "Active" listing. The cards will have some detail regarding the listings. If you want more detail just click on the "Details" link in green. If you don't want any of these listings to be included in your Buyer Tour simply click on the black check mark on the far right of the listing card. On the right hand side of the screen you notice a box that is labeled "Summary of Listings" and "Summary of Prices". This shows you the total number of listings selected along with the low, high average and median of those listings. When showing property order is very important. Properties in the report will show starting from the top. You can change the showing order of the listing cards by simply grabbing the listing card and dragging it to the proper place. Simply move your mouse pointer to anywhere near the address of the property. You'll notice the pointer turns in to a hand. Now click and hold the left mouse button and drag the listing card to the proper slot. When finished release the left mouse button. When you are satisfied with the listings and the order they will be presented click on the "Customize Report" button. The Buyer Tour contains a ton of supplement data to blend with the MLS data. On the right hand side of the screen you'll notice a box labeled "Listing Content" it also includes the header "Report Theme". Here's where you can choose to add or remove any of the supplemental data include with the report. Keep in mind these are global settings, meaning you cannot pick and choose if you want some properties to have additional data and some that do not. If you deselect "Additional listing photos", all additional listings photo for all your properties will not be displayed. So once you have selected what Listing Content you want and what type of Report Theme you want the next step is click "Publish"
When you click on Publish you will be brought back to the Buyer Tour tab. Notice the spinning arrows? That tells you Cloud CMA is generating your report. Once they arrows have stopped spinning you will see a green check mark appear over the report icon. This tells you the report is now ready to View, Print or E-mail. Q. How do I create a Property Report? A. You can create a Property Report in two simple steps. Once I select the Property tab and click on the "Create a new Property Report" button I am presented with one box, labeled "Create the report" with 3 fields to fill out. You will see the property in a rectangular box what we call a "listing card". It will have a letter on the left hand side. Most likely all your listing will be labeled with "A" for "Active" listing. The card will have some detail regarding the listing. If you want more detail just click on the "Details" link in green. The Property Report contains a ton of supplement data to blend with the MLS data. When you click on Publish you will be brought back to the Property Report tab. Notice the spinning arrows? That tells you Cloud CMA is generating your report. Once they arrows have stopped spinning you will see a green check mark appear over the report icon. This tells you the report is now ready to View, Print or E-mail. Q. How do I create a CMA using e-mail? A. Before attempting to create any report in Cloud CMA via email please make sure you have already completed the following steps. 1. You have filled out your Profile completely. This assures that your contact info, photo, and company logo appear on every report. 2. You are sending your e-mail from the same email address registered with your Cloud CMA account. Our servers identify you as a valid user by your email address. Also, understand that the report will default to whatever settings (Listing Layout, Report Theme, Listing Content) were used last. Meaning if you did not include a Walkscore in your last report it will not be included in a report you generate via email. You can generate a CMA via email in 3 simple steps. 2. Type the name you want printed on the cover page of the report in the subject line of the e-mail. This name will be labeled, "Prepared For" on the report. 3. Enter the subject property address in the body of the e-mail. Keep in mind this will pull up to 10 "comps" surrounding the subject properties by default. Unless you have increased the number under the "Edit CMA Report" section. If you wish your client to receive the CMA report at the same time you receive the report include their e-mail address in the CC: line of your email. The report should take less than 5 minutes create and send back to the Cloud CMA subscriber. It should be noted that creating a CMA via email is probably not the best example of using this feature. This is due to the fact that when creating a CMA you will want to spend time culling the data for the best comps. Q. How do I create a Buyer Tour using e-mail? You can generate a Buyer Tour via email in 3 simple steps. 3. Enter the MLS numbers of the properties you want included in the Buyer Tour report. If you wish your client to receive the report at the same time you do include their e-mail address in the CC: line of your email. The report should take less than 5 minutes to create and send an email back to the Cloud CMA subscriber. Q. How do I create a Property Report using e-mail? You can generate a Property via email in 3 simple steps. 3. Enter the MLS number or the address of the property in the subject body of the email.